I made this a few weeks ago for lunch and had rave reviews. Many of you emailed wanting the recipe. I’m sorry it took me this long to sit down and type it up, but a lot of my recipes are in my head and I have to sit down and put them to paper before I can share them. Once you make this recipe one time, you’ll see how easy it actually is and it can be whipped up on the fly in the future. It’s an excellent dish to impress friends at a dinner party and it reheats well so take the leftovers to work and make everyone jealous. In a medium saucepan over medium high heat, melt the butter and whisk in the flour. Cook, stirring often, until roux turns sandy brown, 4-5 minutes. Gradually whisk in the milk/cream and bring to a boil, stirring constantly, until sauce thickens (consistency of biscuit gravy). Remove from heat and stir in the salt, garlic powder and nutmeg. Set aside. In a large, deep baking dish, pour enough sauce to lightly coat the bottom of the dish. Arrange a layer of lasagna pasta on top of the sauce (uncooked pasta). Top lasagna layer with shrimp, crab, bread crumbs and Old Bay seasoning. Top seafood with 1 cup of cream sauce. Add second layer of pasta, then add the sauteed mushrooms and leaf spinach. Top with 3rd layer of lasagna pasta. Pour remaining sauce over the top of the dish. Seal tightly with plastic wrap, then cover plastic wrap with aluminum foil. Bake at 350F for 45 minutes to 1 hour or until sauce is bubbly and pasta has cooked. Remove foil and plastic wrap. Sprinkle top with cheese and allow to melt. Let stand 5 minutes before cutting. Crab meat is cooked as part of the canning or packaging process. Therefore it’s ok to “heat it up”. Spread crab meat in a thin layer on a baking sheet and put in a 300F oven for 5-10 minutes. Any shells in the crab meat will turn bright pink/orange and can be easily removed. If you’re in a hurry, just work the crab meat in your hands and pick out any shells. These days, unless you buy really cheap crab meat, most of the shells have already been removed. 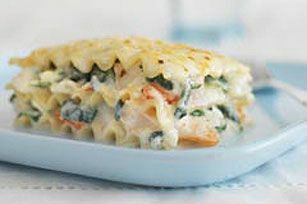 This entry was posted in Entree and tagged bechamel, cheese, crab, garlic, lasagna, mushrooms, shrimp, spinach by quarlj01. Bookmark the permalink.